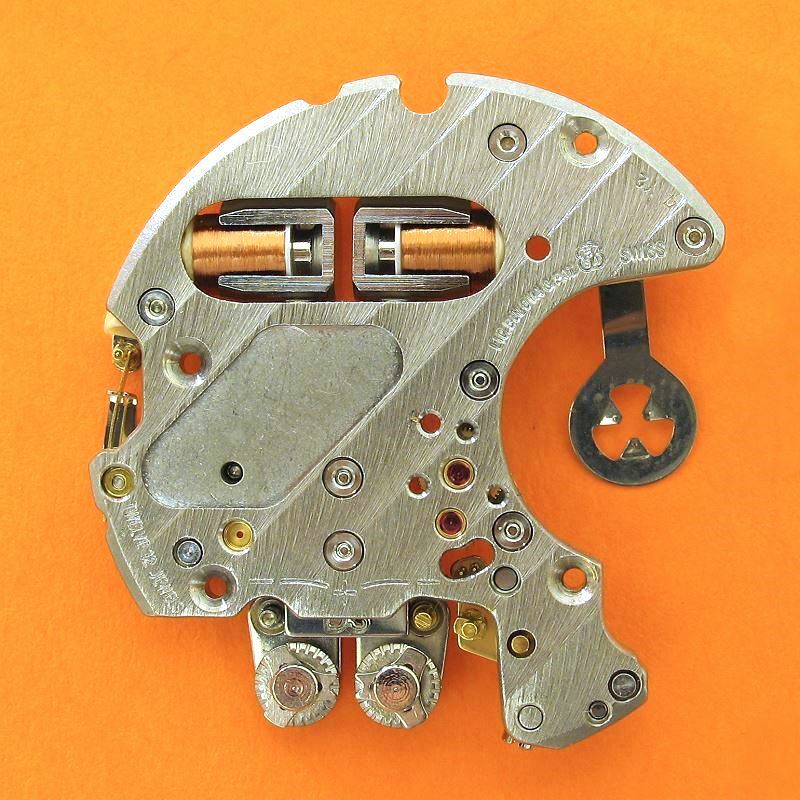 Anyone who has worked on the Omega f300 Speedsonic movement will have nightmares thinking about the chronograph module 🙁 . 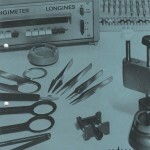 It was ESA who secretly started work in 1970 on the development of a tuning fork chronograph. 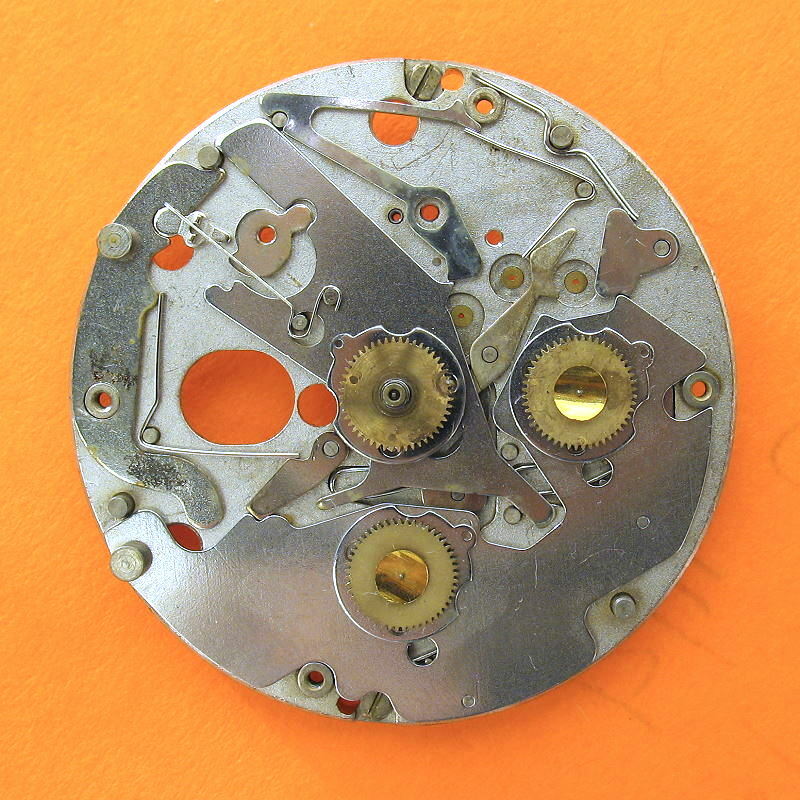 They took their existing ESA 9162 movement, as used in tens of thousands of Omega f300s, Tissot Tissonics, Longines Ultronics etc, and added a chronograph layer to the movement. 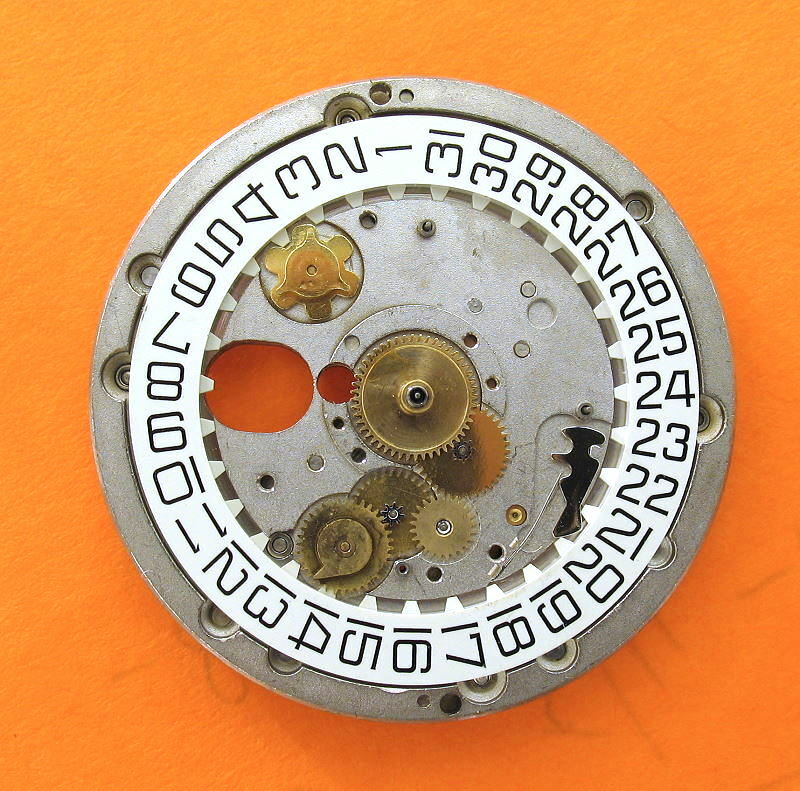 It was finally released in 1972 and is known as the ESA 9210 although many watch makers allocated their own calibre number to it — the Omega version is known as cal. 1255. Back in 2011, I had cause to “open up” the chronograph module on one of my Speedsonics. It came apart really easily 🙂 . But it took me 3-4 days to get it back together again and I vowed never to work on this module again. So when people asked me to service their Speedsonics, I would always say “Yes, fine, as long as the chronograph module is working correctly, as this part is not included.” and, to be fair, the chronograph module usually doesn’t play up unless battery corrosion has got to it. 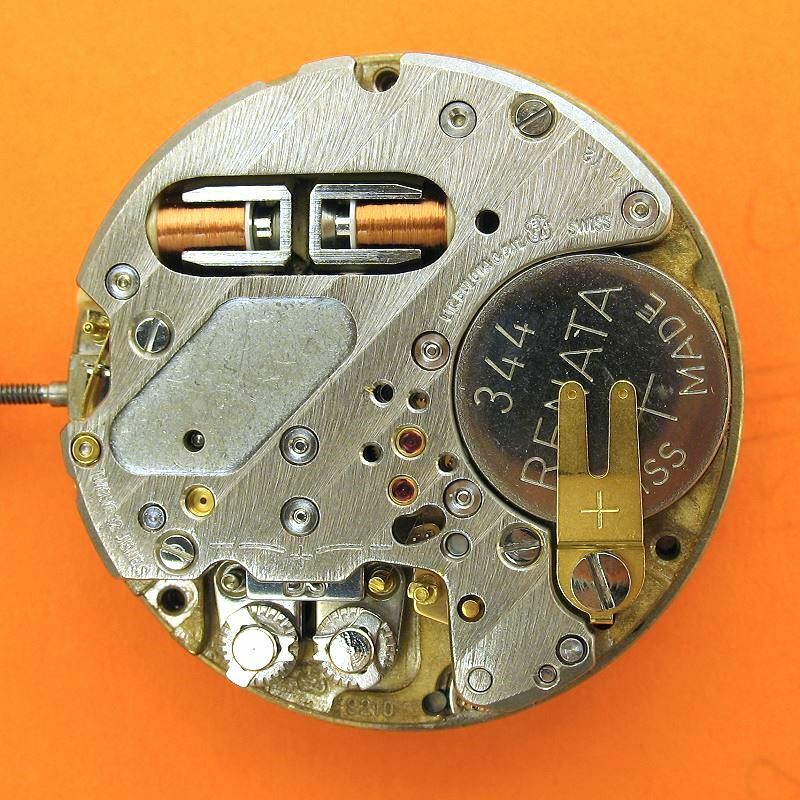 So when I bought a Baume & Mercier Tronosonic Chrono in June 2013, I put its rather sad, broken ESA 9210 movement to one side and replaced it with a NOS movement. But with some spare time, I decided to have another go and restore the old B&M movement. 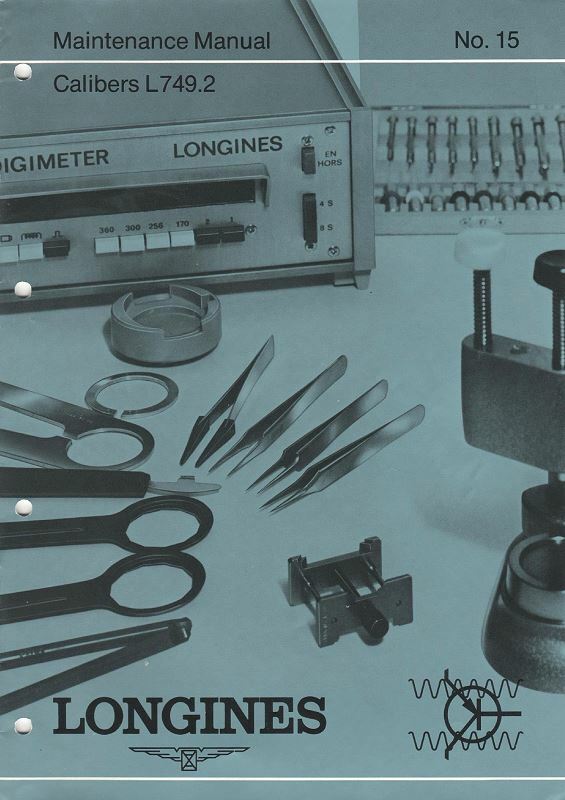 I had one advantage this time; a service manual for the Longines L749.2 movements (Longines branded ESA 9210). And I have to say, with the manual, things went a whole lot easier and that 3-4 days reassembly shrunk to less than half an hour! I’ve can now stripped down and re-assembled the ESA 9210 movement with confidence! 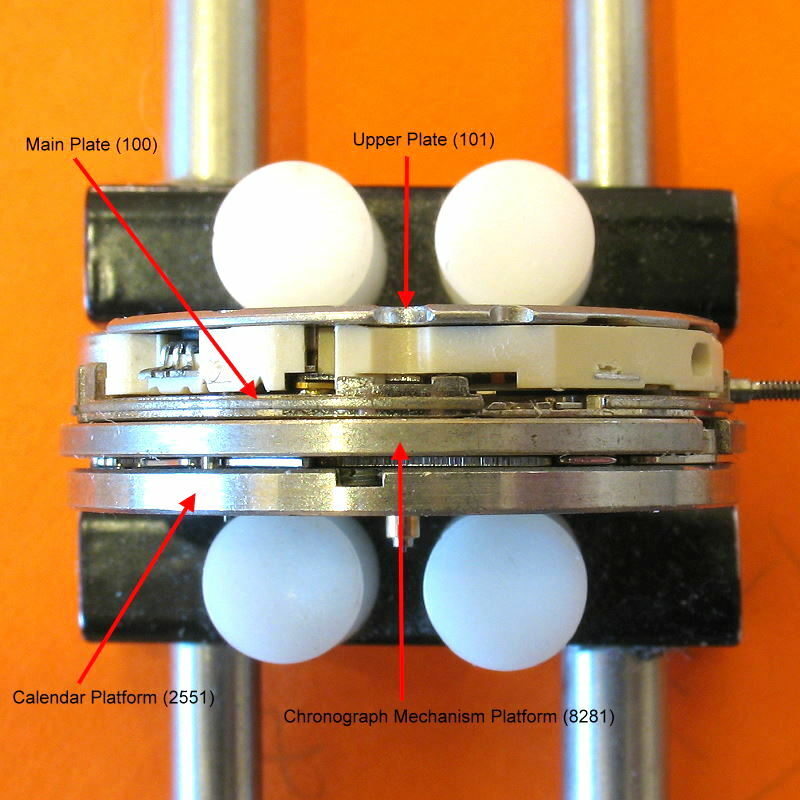 If you click on the image to the left, you’ll see how modular this movement is — it is built up in layers. 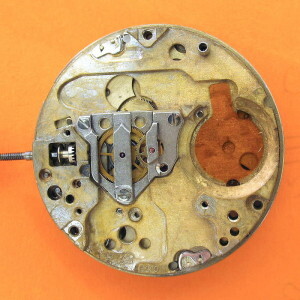 In the photograph, the dial side is at the bottom (although the dial is not attached to the movement). 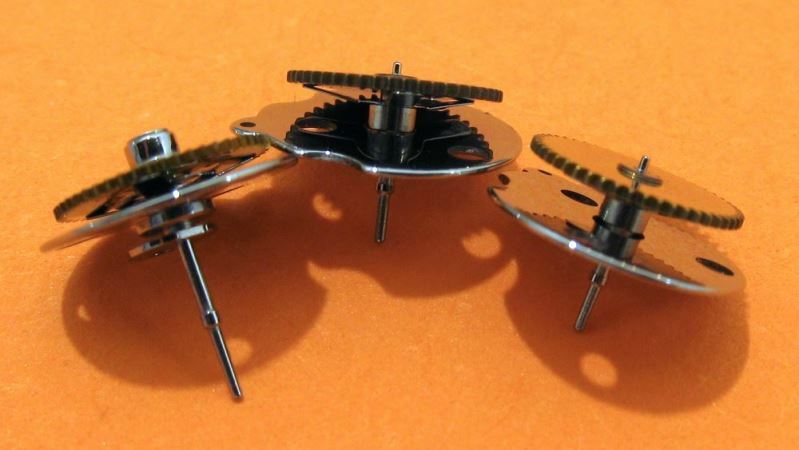 Starting from the top, the first layer is the Oscillator (Upper Plate 101) containing everything to dive the movement: tuning fork, coils, electronics, index wheel. Then comes the Main Plate 100: this has the hand setting works. 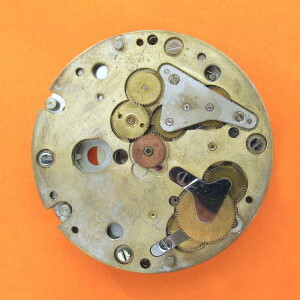 After that, the Chronograph Mechanism Platform 8281 that house ones half of the chronograph mechanism. Lastly, the Calendar Platform 2551 that has the second half of the chronograph mechanism as well as all the day and date wheel works. In the following sections, the plates and platforms that make up these layers are separated out and described more fully. 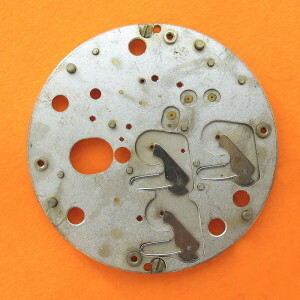 ESA 9210 Upper Plate 101 Oscillator Side. 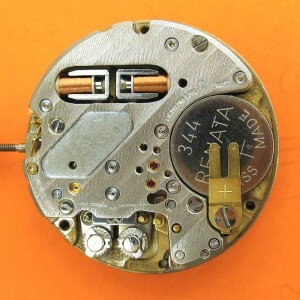 This is nearly identical to a normal ESA 9162 / Omega f300 movement and makes up the oscillator uint (tuning fork, coils, electronics, index wheel, indexing pawls etc). ESA 9210 Main Plate 100 Oscillator Sidedoesn’t affect the movement. 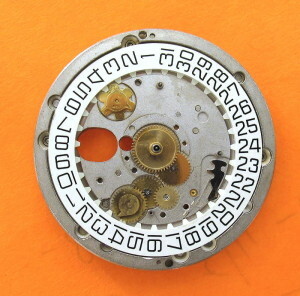 This houses the keyless works and shares only a few parts with the normal ESA 9162 /Omega f300 movement. You’ll notice that the nickel plating has largely been lost on this plate due to battery corrosion. I re-newed the Train Wheel Bridge which is why that looks so much better. The loss of nickel doesn’t affect the movement. ESA 9210 Chronograph Mechanism Platform 8281 Oscillator Side Built Up. Undo those 4 screw around the periphery at your peril. 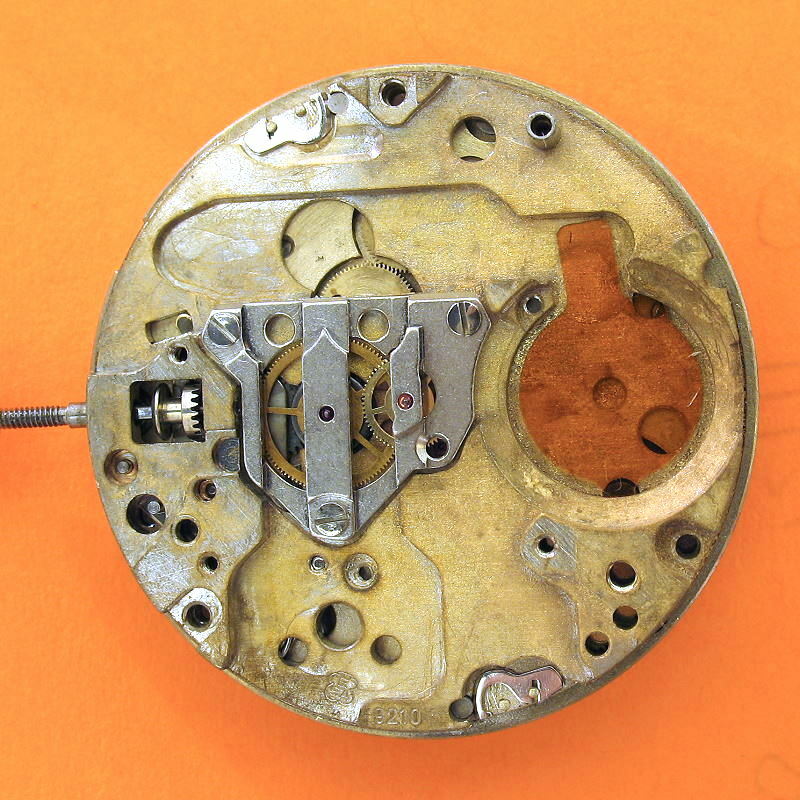 This is back (oscillator side) of the chronograph module and shows the wheels driving the 3 sub-dials. 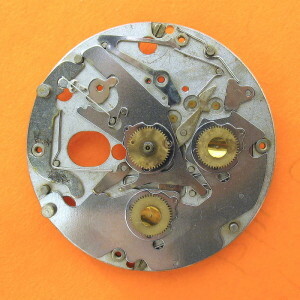 The central copper coloured wheel is the Chronograph Driving wheel (8058) which is a tight push fit on the centre second counter. ESA 9210 Calendar Platform 2551 Oscillator Side Built Up. 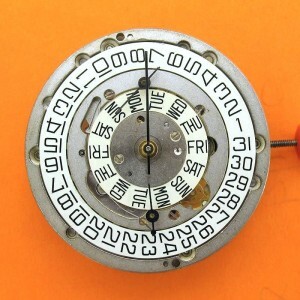 The two chrono buttons correspond to the two round posts at 10 and 8 in the photo below. The mechanism is currently in the running position i.e. the wheels are all free to turn. 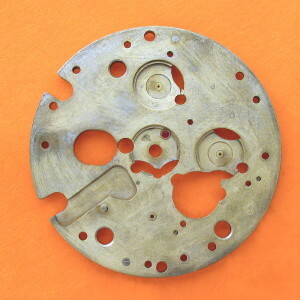 What is not clear in this photo is that the two wheels with brass foils on their tops are first located into the large sliding steel plate (Reversing Yoke Lever 8180) before the plate + wheels are offered up to the main plate — their zeroing hearts are underneath this yoke lever. 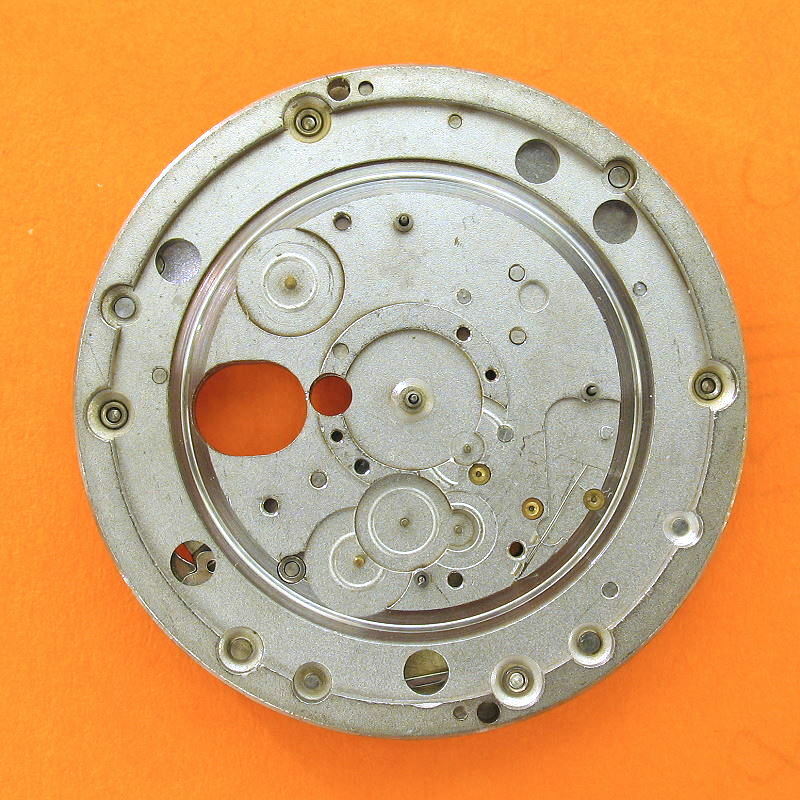 The whole chrono mechanism is under tension here due to the numerous springs…and there are another three hammer springs that you cannot see in this photo….so you have to be very careful when replacing the plate that covers this. 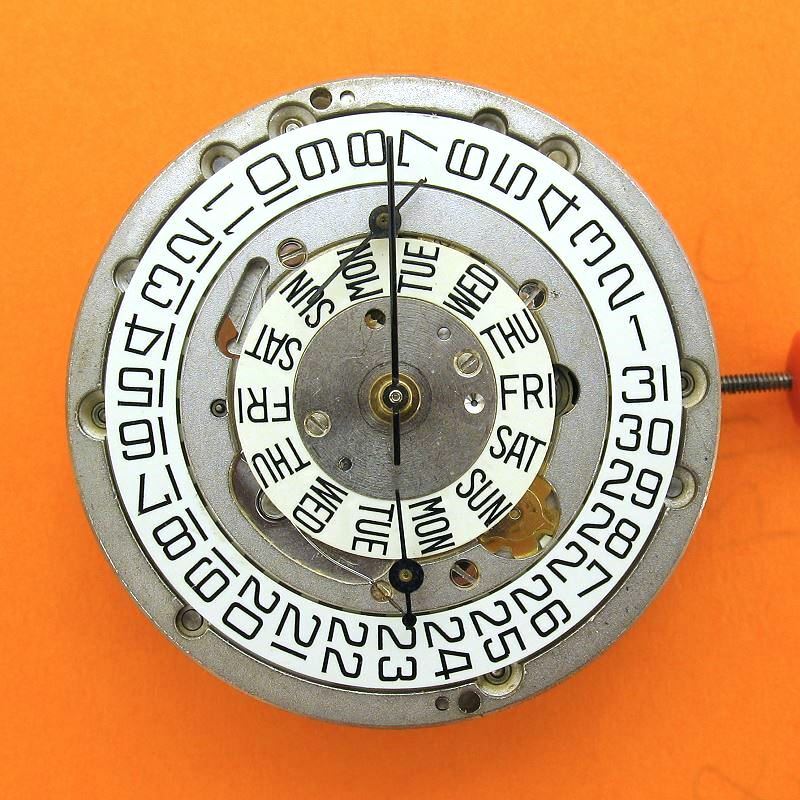 ESA 9210 Calendar Platform 2551 Oscillator Side Hammers and Springs Only. Another shot of this plate but now with most of the chronograph mechanism removed. All that is left are the three hammers and their springs for zeroing the two sub dial hands and the main centre second hand. 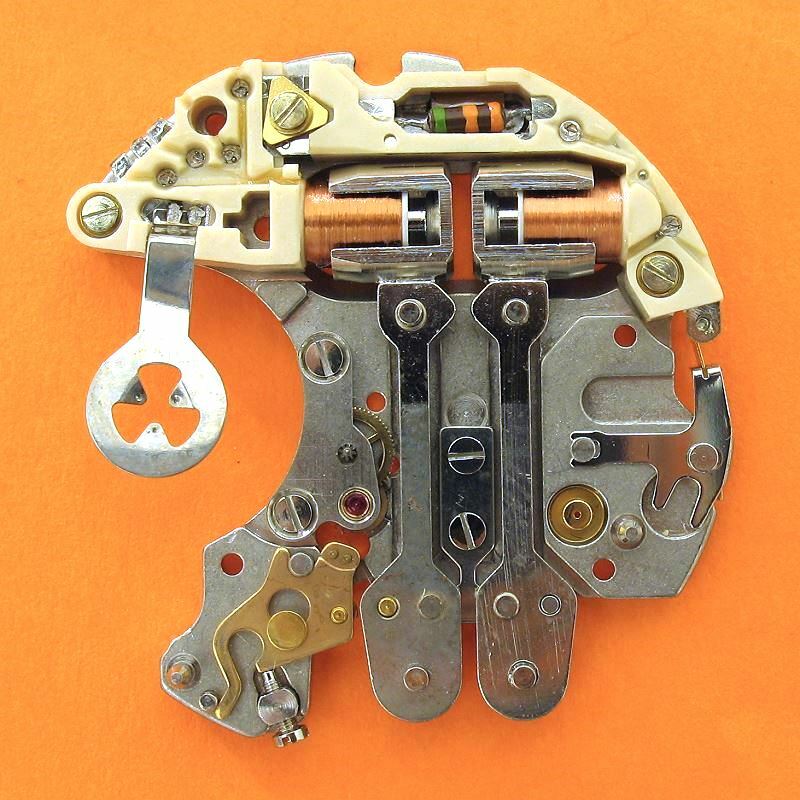 The chronograph mechanism shown below is in the running position. Green Arrows : the direction of moving parts when the Start button is pressed. Red Arrows : the direction of moving parts when the Stop button is pressed. Blue Circle : the part that gives rise to the “click” when the Start / Stop button is pressed. 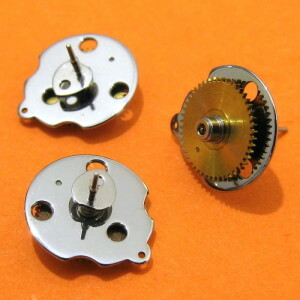 The Fly-Back-Yolk Bolt prevents the Reset button being pushed when the chrono is running. 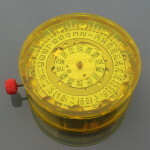 The two brass foils are on the top of the Hour and Minute chronograph counters (see below). 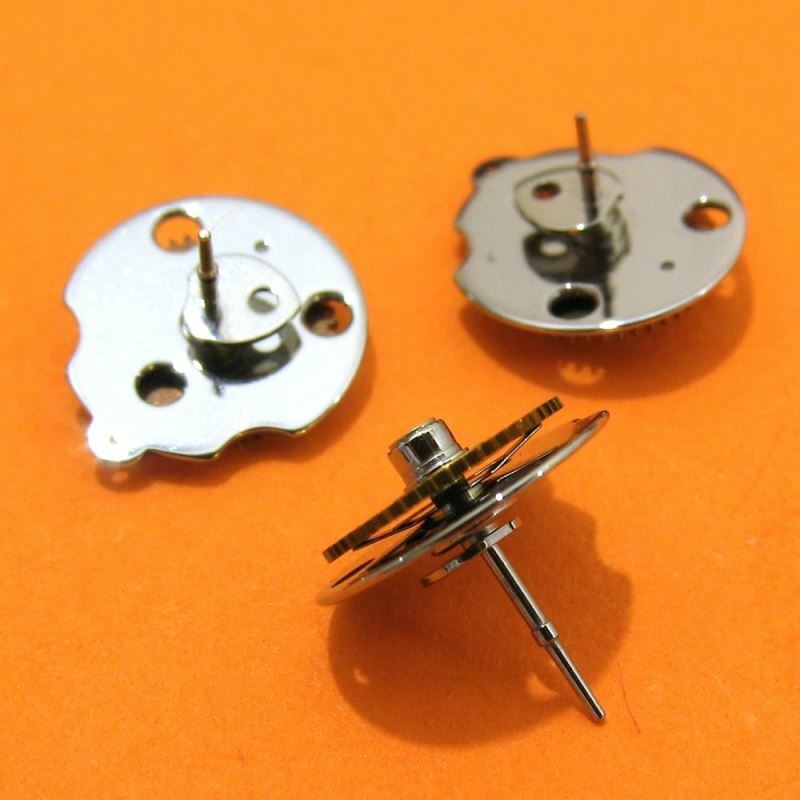 All chronograph wheels are permanently engaged with the rest of the movement. 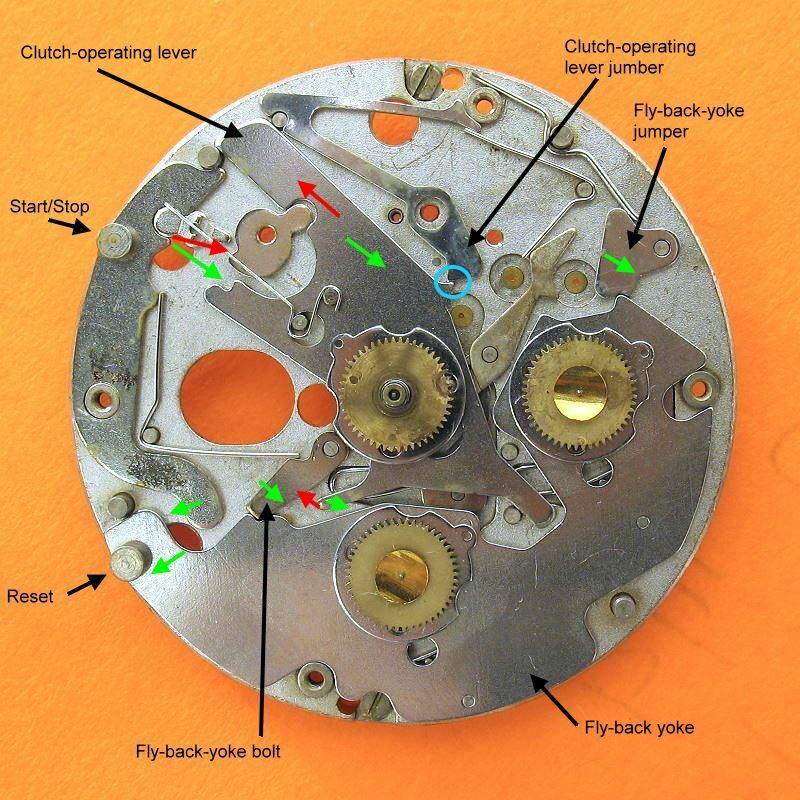 The Start / Stop button operates, via the Clutch-Operating Lever, a clutch on the centre second wheel to control whether the chronograph is engaged or not. The constant second wheel is not in the photo below. These are new items which is why they are nice and shiny. In the stop and reset positions, the large 3-holed floating discs get pushed up towards their gear wheel. 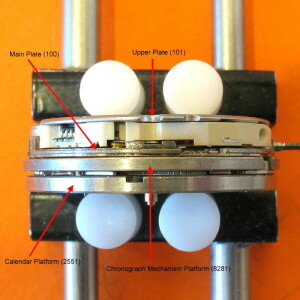 The main centre second chronograph counter is the one with the longer hand shaft; the bottom counter in the second photo. The brass wheel on this counter drives the rest of the chron mechanism. 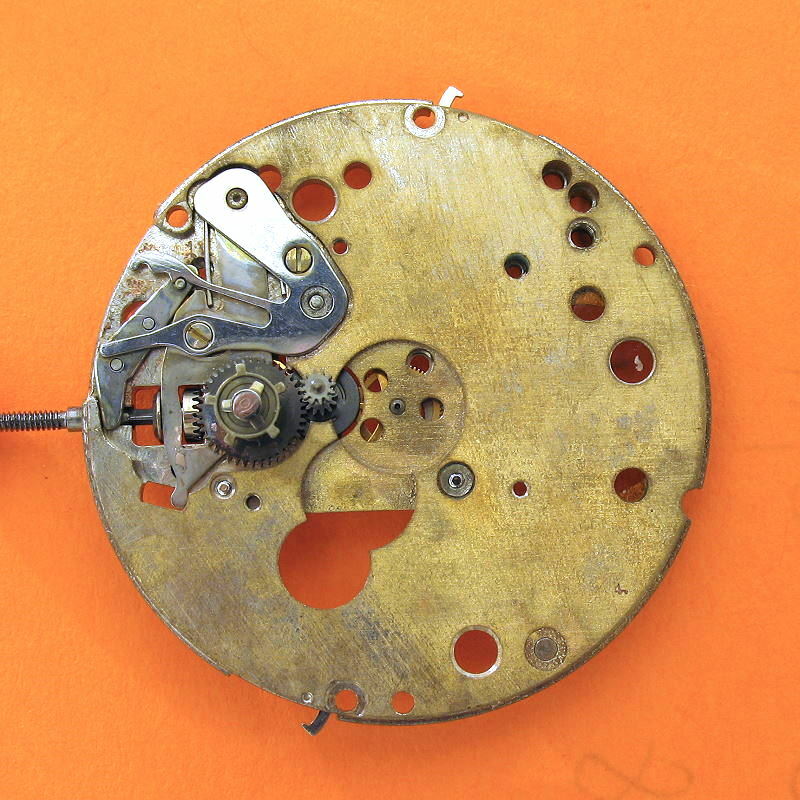 When assembled into the movement, this counter has a copper coloured Chronograph Driving wheel (8058) pushed onto the top stub of the counter — you can see this in the fourth photo; the driving wheel is right in the centre of the movement. 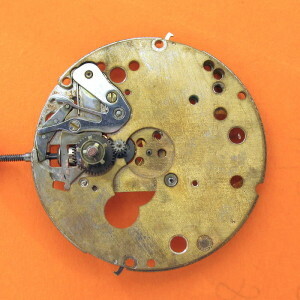 It is this copper coloured Chronograph Driving wheel that is affected by the clutch mechanism — in one position, it is locked to the rest of the counter assembly and therefore drives the chono mechanism, but in the other position, it rotates freely at the top of the counter without driving it and therefore the brass wheel below it does not drive the rest of the chrono mechanism. ESA 9210 Chronograph Counters. Main centre second chronograph counter on the right. ESA 9210 Chronograph Counters. Main centre second chronograph counter at the bottom.